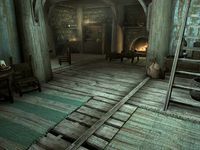 Uthgerd's House is the home of Uthgerd the Unbroken. 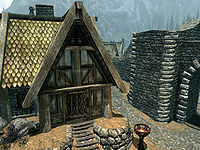 It is located in the Wind District of Whiterun, across the street from Carlotta Valentia's House. It is owned by Uthgerd the Unbroken, although she rarely sets foot in the house, spending most of her time inside The Bannered Mare. It consists of one zone, Uthgerd's House. She will always be in residence during the Battle for Whiterun and may be found there at other times. It is the first house on the right as you enter the Wind District of Whiterun from the stairs nearest the gate. There are three lavender plants around the house which is attached to Amren's house. The front door opens to the living room, with a ladder leading to the bedroom upstairs. Left of the door sits a small table with a bottle of ale and a sweet roll on top. At the foot of the ladder is a dresser with some random clothes. Under the ladder are three food sacks, two food barrels, a bowl with four potatoes, an end table with clutter, and an unlocked chest with a bit of gold. In the northwestern corner is a dinner table that seats three, laid with a bottle of ale and a piece of bread. In the adjacent corner is a cupboard with clutter, while the shelves above hold a goat cheese wheel and an eidar cheese wheel. At the foot of the cupboard, scattered on the floor, are three carrots. A small table in front of the fireplace holds a bottle of alto wine, an eidar cheese wedge, and a boiled creme treat. The alcove to the south has a small cupboard with clutter with four tomatoes on top. A bookshelf holds several common books. The ladder leads upstairs where a wardrobe contains some clutter, clothes, and a slim chance of some jewelry, while an unlocked chest holds a bit of gold. A display case contains two iron daggers. The bedroom has a dresser with random clothing and the end table near the bed contains clutter. At the foot of the table sits a pair of boots and on top of the table is a bottle of alto wine and a bowl with five red apples. Once you recruit Uthgerd as a follower, all items, including the bed, are free to use. There is an "Empty" shadowmark to the left of the entrance door due to the sparseness of loot; however, the location will no longer be so empty if you are on one of Vex's burglary or sweep jobs. This page was last modified on 29 August 2018, at 18:17.